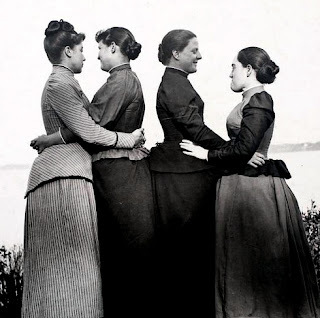 The Alice Austen House in Staten Island New York will formally celebrate becoming a National LGBTQ Historical Site at an event on Tuesday, June 20th at 11A. The designation marks an important milestone for this historic house in bringing forth the LGBTQ story represented there. Alice Austen House is a nationally landmarked museum devoted to the trailblazing American street photographer Alice Austen (1866-1952). Austen was in a loving & devoted relationship with Gertrude Tate for more than fifty years & nearly 30 of those years were lived together at the Austen family home that serves as the museum. As part of an initiative of the National Park Service launched in 2014 the Alice Austen House’s listing on the National Register of Historic Places has been amended to include LGBTQ history as an area of significance. Alice Austen captured a changing New York City in more than 7000 photographs taken mostly around the turn of the twentieth century. Austen documented her life on Staten Island & went onto the streets of Manhattan to photograph the activities of immigrants & the working class. She was versatile & forged her own path without much regard for acceptable Victorian behavior for women. Austen was a master tennis player, an early advocate for women riding bicycles, founder of the Staten Island Garden Club & is said to be the first woman on Staten Island to own a car. During the June 20th event, photographer& activist Joan E. Biren (JEB) will speak. Biren is an award-winning documentary photographer & filmmaker & has been chronicling the lives of LGBT individuals for more than 30 years.